Oh, well hello there! It’s been a while! Sorry for my extended absence, but if you follow me on Twitter you already know that I have spent the last month working furiously on my second cookbook. I am happy to report it is all done, all 30 pictures included, and if all goes as my publisher plans it will be seeing store shelves sometime next May! Also, my first book, Everything Pie, should be available in a book store near you. Between the book, attending IFBC in New Orleans, learning I will be speaking at Camp Blogaway in 2012, and wrapping up a major office remodel at work (my secret daytime identity is that of a mild mannered office manager if you did not know) I felt the need for some brownie love. These fudgy little wonders are a product of having three kinds of chips in the pantry, but only about 1/4 cup each. I thought about making cookies with them, but then I remembered it had been a little while since I had made brownies. Then I remembered it had been even longer since I made blondies. To split the difference I decided to make both, with three kinds of chips, all swirled together. 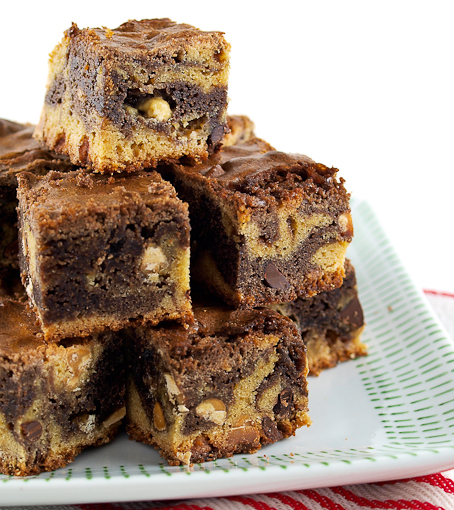 The finished product is the right balance of blondie to brownie, and the variety of chips means no single bite will taste exactly alike. I absolutely adore that! 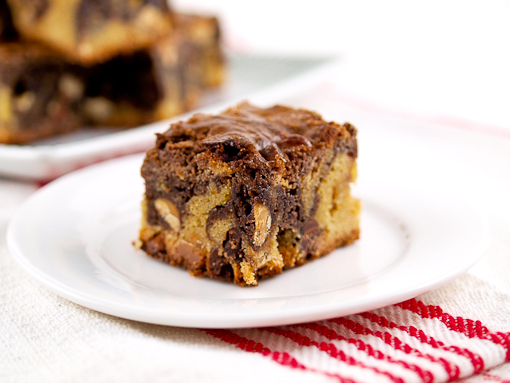 One note, be sure not to over-bake these or they will loose their fudge like texture and become a little hard. I suggest removing them from the oven a minute before you think they should be done. 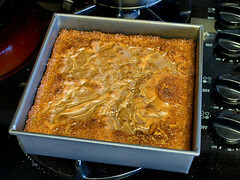 Heat the oven to 350 F and spray an 8×8-inch baking pan with non-stick cooking spray. 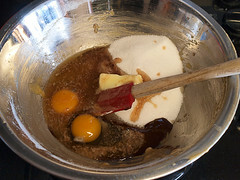 In a medium bowl mix together the butter, brown sugar, egg, egg yolks, and vanilla. Once smooth add in the flour and salt. Stir until the mixture is just smooth then add the chips and stir to combine. Set aside. 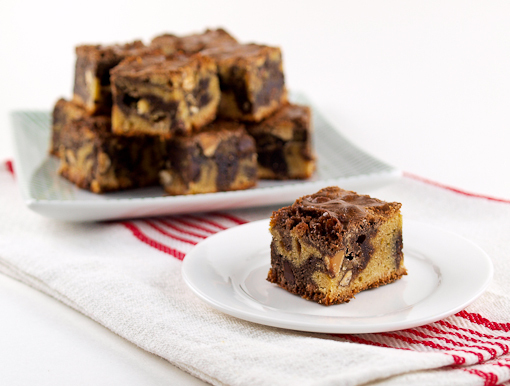 In a microwave safe bowl combine the butter and first addition of chocolate chips. Heat for 20 seconds then stir. Heat on 10 seconds bursts until the mixture is melted and smooth. 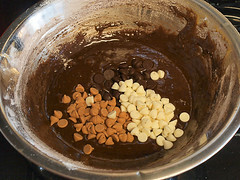 Pour the melted chocolate mixture into a medium bowl and add the sugar, egg, and vanilla. 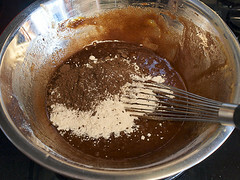 Mix until smooth then add the flour, cocoa powder, and salt. Stir until the mixture is just smooth then add the chips and stir to combine. 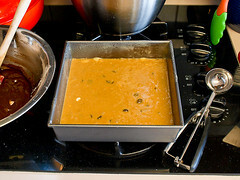 Spread the blondie mixture into the prepared pan, then spoon the brownie mixture over the top. 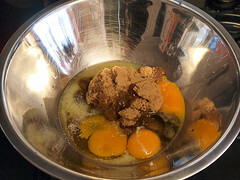 With a butter knife swirl the mixture by dipping the knife into the batter and folding it so the blondie mixture swirls to the top. Do now over-swirl. 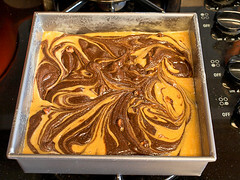 Bake for 25 to 35 minutes, or until the edges of the brownie are firm and the center is just set but not firm. 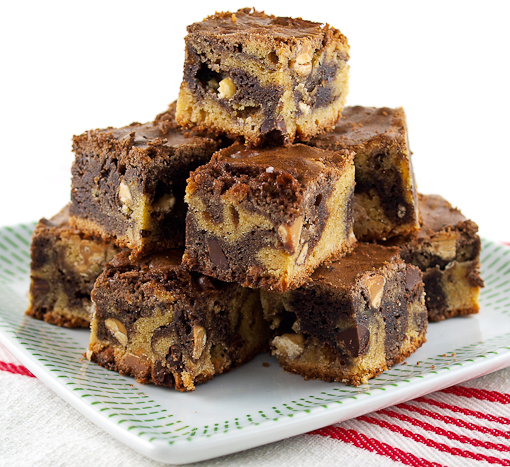 If the brownies jiggle they need a minute or two more. Remove from the oven and cool for 20 minutes in the pan, then turn out onto a wire rack to cool completely.